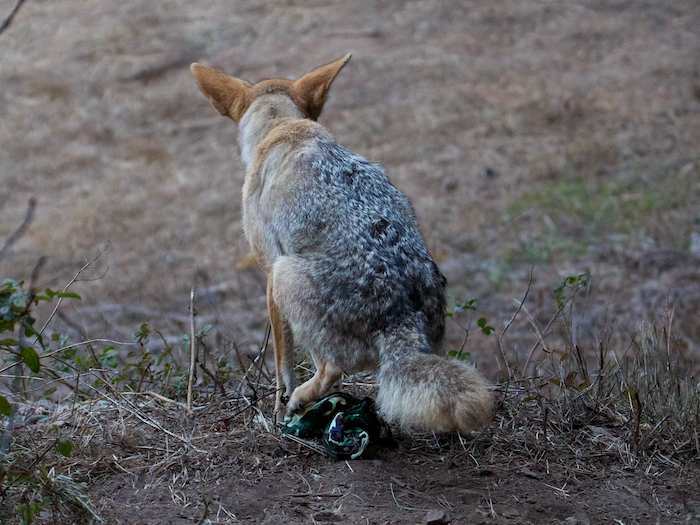 But quickly the coyote discovered something he didn’t like about this food — its stickiness. As I watched, the coyote tried to unstick it from his mouth, but it took some effort — the melted sugar was like glue that wouldn’t let go. Finally he got it off his mouth and let it fall to the ground, and then he walked quickly on. “YUCK!” Roasted marshmallow was not going to be one of his diet items! 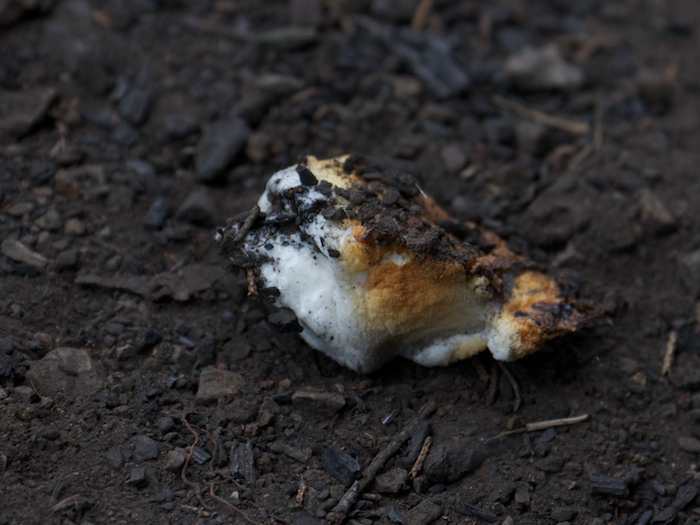 Please see another, fascinating, and very different story about marshmallows, written by, and posted on, Out Walking The Dog. I’ve lost a variety of things while out and about in the parks — mostly items of clothing. My things tend to be earth toned, which doesn’t help when trying to locate them, but I seem to have found almost everything that went missing — they usually reappeared just lying on the ground where I inadvertently had dropped them. I found a brown coat within three weeks, a little faded from being in the sun but otherwise in good shape, to my surprise. Caps have turned up within a week of being lost; a scarf turned up two days later — it had been folded and put aside by a friend. And I always manage to find my lost handkerchiefs — one with the aid of a coyote who “pointed it out” to me when she decided to “mark” it! And then there was the cap which I never did find. It disappeared a year ago. I had long since given up any hope of finding it — I had searched for it for weeks with no luck. It is the only object which I had permanently lost, I thought. Then, yesterday I was taking photos at dawn of two coyotes playing “keep away”. I was focusing in on the exciting game the coyotes were playing, so I didn’t really notice the object inspiring their play until well into the game. What was that limp “toy” they were playing with? As they played, the lost cap slowly came to mind as a far-fetched possibiliy. Hadn’t I lost it in this exact same vicinity? I made a note to myself to check it out when there were no coyotes around. So, later that day I returned, and, sure enough it was my cap! Should I take it with me or should I leave it for the coyotes? I decided to take it home — it would have just been trash in the park — where I washed it thoroughly several times and put it on! It had been my favorite cap. But now I have another worry: What if the coyotes recognize it on my head and want it back? Of course they won’t, but the thought did occur to me! One of the places where I observe coyotes has apple trees. 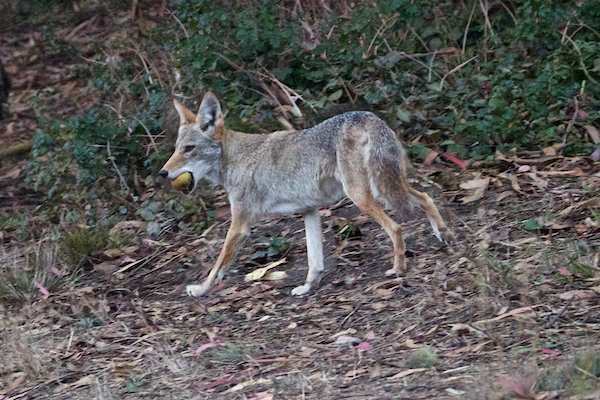 I had been waiting to catch a coyote eat one of the many fallen apples, but for years I never saw it happen. Coyotes are “opportunistic” eaters, which means they’ll eat pretty much anything, so I knew apples were on their list of possibilities as a food source. But all I ever saw was the apples in the trees, and later on, apples on the ground. And coyotes passed them by without a second glance. My dog used to love apples, while other dogs wouldn’t touch them, so I thought that maybe it had to do with personal taste? Then, yesterday, at a time of the year when few apples still remain on the ground, I saw a coyote eat two in a row for the first ime. 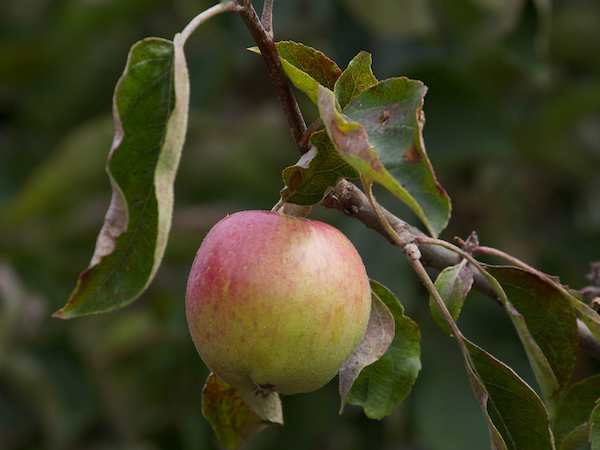 The first apple was munched, bite by bite, casually, as you or I would eat it, crunching each juicy bite, and enjoying the taste. As the coyote ate, and as I watched, someone appeared coming down the path close to where the coyote was. The coyote took off in a hurry. But it turned it’s head, and I could see that it had an entire other apple in its mouth. The first one must have been really good! Notice the neat variety of voices in this family concert. 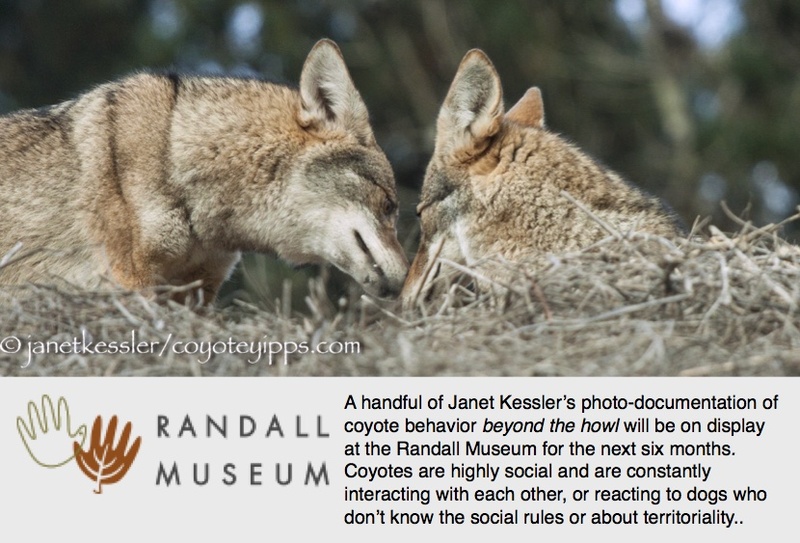 It involves four coyotes: two youths and two adults! It was prompted by the sounds of a distant siren — or, maybe it wasn’t distant, but just sounded distant because of the wind and fog. The fog was thick and the wind was gusting, creating the ambient sound you hear in the recording. The weather added to the mood of the “piece”! I think, possibly, that a happy family chorus serves the same purpose for coyotes as a big family hug! To understand why I made “Coyote” you first must have some idea of what Burning Man is. The festival takes place in the Black Rock Desert of Nevada and is attended by thousands of people who enjoy open spaces and the freedom to live freely, not unlike Coyotes themselves. 2013 was the 5th year of my receiving an art grant from Burning Man. 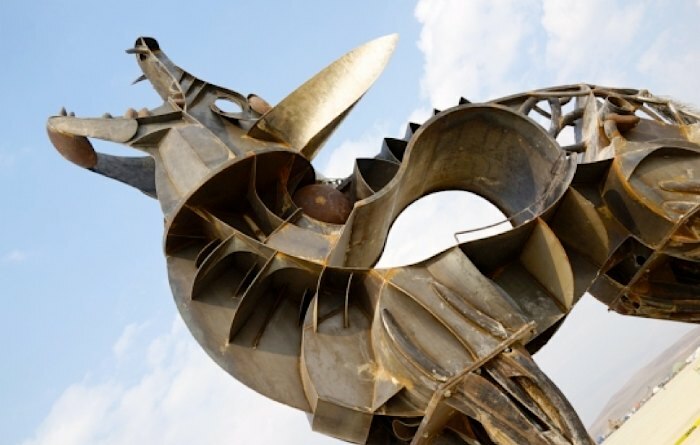 In past work for Burning Man I had made insects, birds, snakes and architectural pieces but never a four legged animal. I am a professional sculptor and some of my most successful work includes life-sized horses, a bull, and a lion. I decided to build “Coyote”, but on a monumental scale, for the event as it seemed the natural four legged animal given the context. At 26′ tall, this giant beast is climbable and has a rotating head that can turn into the wind. Weighing in at 7 tons, this steel and stainless steel creature will be with us for many years to come, as I am sure wild coyotes will be too. This recording was definitely a special one from last night, very full of love and excitement. Reminds me of when my dad used to come home from business trips and my brother and I would be shrieking with glee! These native California bunch grasses seem to be useful for something! This coyote stopped for a scratching session, using the plant as a tool to thoroughly scratch all over! He scooted through the stiff rough blades on his belly, on his back and on his sides. I guess that covers everything. He then shook himself out and walked on.